For the IPCC AR4, "weather events are climate" – looks like another retraction is needed | Watts Up With That? We’ve been admonished by others in the blogosphere when we report on record cold weather or record snow stories of interest by hurling the maxim: “weather is not climate“. Yet when the IPCC does that, linking specific weather events in the IPCC AR4 report, such as a single heatwave, the same people have no complaints. As Davis Rose on the Times reports, the IPCC, under Pachauri’s leadership, botched that too. 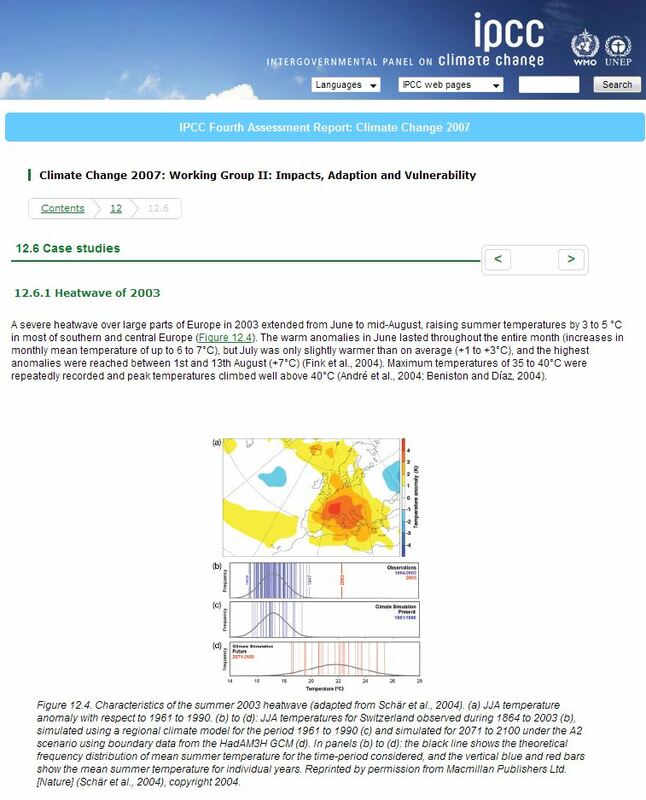 Now it looks like the IPCC will have to withdraw yet another part of the report. The new controversy also goes back to the IPCC’s 2007 report in which a separate section warned that the world had “suffered rapidly rising costs due to extreme weather-related events since the 1970s”. The Sunday Times has since found that the scientific paper on which the IPCC based its claim had not been peer reviewed, nor published, at the time the climate body issued its report. Despite this change the IPCC did not issue a clarification ahead of the Copenhagen climate summit last month. It has also emerged that at least two scientific reviewers who checked drafts of the IPCC report urged greater caution in proposing a link between climate change and disaster impacts — but were ignored. As such, the 2003 heatwave resembles simulations by regional climate models of summer temperatures in the latter part of the 21st century under the A2 scenario (Beniston, 2004). Anthropogenic warming may therefore already have increased the risk of heatwaves such as the one experienced in 2003 (Stott et al., 2004). But, it’s apparently OK when peer reviewed scientists do it. h/t to WUWT reader Dirk H for the IPCC reference. January 24, 2010 in IPCC. Looks like global warming is fraying a bit around the edges. If this keeps up, the MSM will be dragged kicking and screaming into reality and the politicians will no longer have that excuse for a revenue/resource grab. AR 4 is propaganda, nothing more, nothing less. Remember the illustrious British PM Gorgon McBruin telling us that the flooding oop north was due to climate change? When in fact it was “weather” coupled with man’s unerring ability of creating urban development in areas prone to flood. Running with the hare AND the hounds – you can’t have it both ways. And he calls us “flat-earthers”, and “unintelligent”.. It makes my blood boil, and I have dreams involving physical violence where his teeth accidentally strike my boot a number of times, your worship. Phew, thats better…. The politicians are going to start throwing the climate scientists under the bus soon, I predict. But Dr Landsea resigned in 2005! They don’t want to listen. They won’t listen. So, they will be dragged kicking and screaming into listening. Philosophical Question: How many rotten bricks does it take bring an edifice down? Remember the illustrious British PM Gorgon McBruin telling us that the flooding oop north was due to climate change? ……. I have dreams involving physical violence where his teeth accidentally strike my boot a number of times, your worship. Phew, thats better…. Just vote. After 30 years living in California and not voting, I’m going to go through the pain in the @rse of registering to vote in the UK. I have no idea who I’m going to vote for. I’m registering purely to vote against that unelected freak. I will be more than one vote too … I’m betting my position will get another 50 or 100 voting with me, maybe even a bigger chain reaction. Given Lord Monckton’s position, I think it will be UKIP. 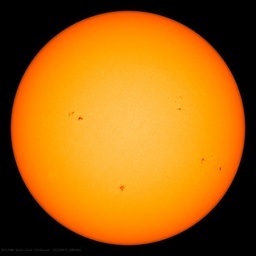 Soon they’ll be reduced to claiming the sun rising in the east is irrefutable proof of AGW. It’s about the only thing they can’t goof on at this stage. The massive IPCC scam demands a class action either against the panel itself or its frudulent representatives, best filed in the US as they have the legal system that best punishes deliberate misrepresentation. Wattsupwiththat is probably the best forum to organize such a claim in view of the wide reach of readers. It also demands immediate resignation of the IPCC board who have proven to be in want of the most basic scientific integrity. They are a complete failure given that they are a panel to serve the nations of this world, not to deceive them. There should be some intelligent attourney amoung the readers of this site who can translate this fraud in legal relevant claims and hit the guilty in their wallet or maybe even initiate penal law repercursions. It’s raining buckets on the IPCC right now. The philosophers are all to kind. I must admit I view these actions from a much more cynical point of view. This writer lacks the talent of a Mencken or Twain. I have no glib comment to offer. I think they know perfectly well when they play fast and loose with the ethics and morality that lay at the foundations of the Philosophy of Science. I think what is most unsettling to me the arrogance of Mythos that replaces the humility of Logos. what do you want to bet that the CAGW will say the same thing about all of the tornadoes coming this spring. Had 14 on the 20th, 12 on the 21st, 3 on the 22nd, and a major outbreak coming as the Moon goes to Maximum North on the 27th, then heads south as the Earth has a heliocentric conjunction with Mars, which will add to the severity of the system. Should be a fun next weekend, the CAGW people will be screaming all about more severe weather due to climate change BS. Tell them you heard it here first. UN wrongly linked global warming to natural disaster, CO2 and then make false presumptions that they can also relay the apparent inherent cost each natural disaster encompasses. Rulers of the Universe indeed. Three wheels on my wagon, but I keep rolling along. Two wheels on my wagon…..
Moonbat in the UK Guardian is also silent on the imploding IPCC, instead he is giving out plastic cup awards. The comments are worth reading to show the wind of change. Pielke Jr.reports on alterations of the Stern Review Report. Unless of course they use their moral compass to determine East and West. The AR4 is chalked full with opinion, assumption, and speculation. Most of the so-called science in it does not carry actual evidentiary causation… just assumption of correlation. This is not how any other scientific discipline carries out its methodology and conclusions. More and more will continue to surface regarding the AR4 opinionated propaganda piece. And then we will get the pleasure of sitting back and watching as the rats jump ship, one by one… back peddling and covering their tracks. Have the IPCC ever given a scientific definition of when weather becomes climate that we can hold them to.? p.s. I know all the jokes of when its hot its climate and when its cold its weather. Nemesis>> I believe a common definition of climate is the average weather of 30 years or more. If it’s hot, it’s Global Warming. If it’s wet or windy, it’s catastrophic Climate Change. If it’s cold, cautiously try Climate Change but don’t push it too hard. If that doesn’t work, it’s weather. It may be safer to say weather right off. The big worry about all this negative publicity for the IPCC and “Global Warming” is that it may end up killing any and all interest and government backing for research into climate change. Climate change happens. No-one disputes that. The only dispute is attempting to link this to human activity and predicting catastrophe if we don’t all retreat to the stone age or pay vested interests huge sums of money. There may be good reason to continue research into climate change, not to look for culprits, or ways to make money out of it, but to guide governments on any policy and investment changes that may be prudent to make. For example, if we really are on the edge of a Bond event, investment in building up energy resources as quickly and cheaply as possible may be warranted if we don’t want to see large numbers of people freeze to death. But because of these criminals, the reaction may be that of governments that have been bitten by people crying wolf once too often. We know there are more scientists being bypassed/silenced in the process. Maybe they will come forward one by one now. Sea-levels next to go? Just dont let the frequence of such news be too high. Its going too fast now. Once every 14’th day will do nicely. The IPCC don’t seem to be weathering the current climate very well. Poochie and his IPCC are seriously past their Expiration Date. Toss ’em in the dumpster for hauling to the nearest landfill. As I understand it, weather is observed with instruments and climate is observed with computer models. The funny thing is that the “it’s weather, not climate” mantra has been invented for the sake of protecting AGW from the vagaries of the real world. Trouble is, such a way of thinking quickly drags “climate” into the realm of the absolutely irrelevant. The Warmists are caught in a Chinese Finger Puzzle: The harder they struggle…. the deeper the journalists dig into thier closets. The IPCC Big Rig is jack-knifed with a load of garbage in rush hour traffic. Want to get away ? The Snickers are on the house. I think the official definition of climate is 30 years. However if I go by my local glacier advance/retreat cycles its more like 50-60 years. 30 years advance + 30 years of retreat completes one cycle. Every single piece of evidence FOR CAGW, turns out to be wanting when examined honestly. They would be incorrect about that also. Only rises in the East twice a year. The underlying problem is that there is, a global cabal of major wealth holders, who want to be in power, and the viability of the developed world keeps heading them off. This current UNIPCC fiasco is just the current attempt to pull strings, on placed puppets to hand them what they want, so they don’t look implicated just opportunistic. When this phase ends they will try a new tactic, from a more sinister hidden agenda. That depends on how much tax money they can continue extort from us to keep shoring the edifice up. That depends on what your definition of the word “is” is. What do you mean “another retraction”? The IPCC has not retracted anything. They only said some mistakes were made, but I haven’t seen any statement that they are changing their material. I don’t think it would end up killing all interest and funding in climate research. We might see a cull of the institutions which have most veered from science to AGW propaganda. I don’t see that as a bad thing. For instance, I’d welcome the Met Office taking far less interest in climate change and especially AGW advocacy, and concentrating on weather forecasting. As it is, I’d say there was too much effort directed to climate research, some of it very dubious such as computer modeling, at the expense of other things. The political interest has inclined it to produce conclusions favourable to its paymasters. There’s also an overflow where work not obviously related to climate change has to declare its relevance to AGW, which is not IMHO healthy, and a set of NGOs and university units etc, carrying on about the social consquences of AGW and also involved in advocacy. I wouldn’t be sad to see that pruned out as frankly there are better things to spend the money on. Your comment is right on! I would only add that it may be more than frayed but is unraveling. The money problem has finally been addressed via this article. It says the faked ‘natural disaster’ prediction was used as basis for demand of $100 billion in Copenhagen from so-called rich nations to poor ones. The US said it would contribute (based on a now proven lie). The second home run from this article, it quotes Obama saying the world can expect more storm activity (a conclusion that could only have been based on the fake report, not that he needed the help having been in on the creation of the Chicago Climate Exchange, having declared climate a national security issue, and that his EPA is prepared to act based on false data, and the Supreme Court 5-4 decision that CO2 is a dangerous pollutant has to remain to back up the whole grab). Article also quotes Miliband and Gordon Brown predicting disasters. Al Gore’s movie now has no grounds to be in any school. Here’s evidence of the BBC treating hot weather as climate: “Scientists believe that such unseasonal temperatures are the result of global warming and of the climate’s natural variability. “. So a case of warm August in Australia == climate, though BBC doesn’t say which scientists. There are lies, damned lies and the IPCC AR4 report. Ah-ha! But if there was no dramatic warming then it would be snow! See, the IPCC is right, a weather event is proof of AGW. Refute that, skeptic! How about backing up and learning how to predict next weeks weather? Maybe just get one hurricane right? These bozos are so far out of their league it’s not even funny. And yes climate is weather. If it isn’t, why are they using the same computer programs? Please let them do that, it would be the biggest possible “goof”. Depending up on the latitude and the time of the year, the sun rises in an arc of 180 degrees varying from due north to due south. It only ever rises in the east in the tropics and even then it is dependent on the time of the year. A “scientific” paper should not include generalised common “knowledge” but proper measurements and error ranges. I could just see it, “The sun rises in the East plus or minus 90 degrees.” In an IPCC document (or other warmist lierature), no way! 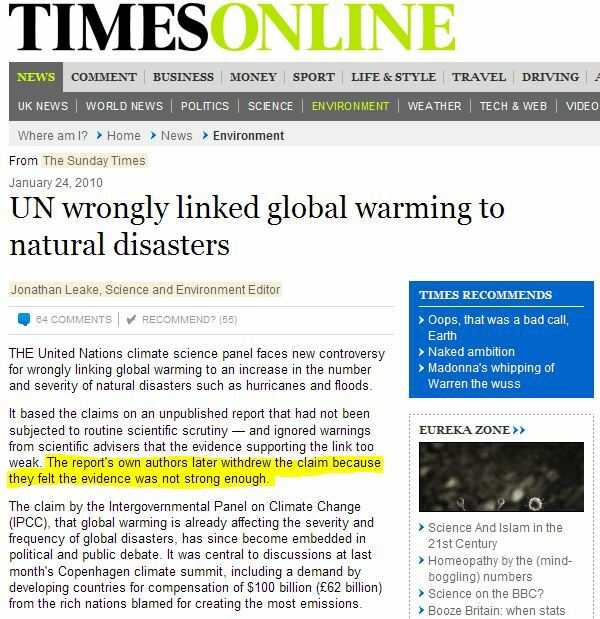 I’m not sure if the U.K.’s “Mail Online” can be considered as MSM, but certainly a Jan 23 article by one of its reporters is sufficiently error-riddled that it might warrant inclusion in the next IPCC Assessment Report! Requires that they junk thier Climate Panic Models. You can lead a warmist to weather, but you can’t make him model it. It is instructive to look at how the Guardian is handling the crisis in their belief system. The paper started by reporting the ‘errors’ in the IPCC report as a big fuss over minor typos. The comments section under these reports quickly attracted a host of people saying ‘Oh, no, it’s not….’. “…the Supreme Court 5-4 decision that CO2 is a dangerous pollutant…” never happened. What the Court ruled was that the EPA’s enabling legislation entitled the agency to declare carbon dioxide a pollutant and regulate it, if it cared to do so. By the same ruling, the EPA could declare dihidrogen monoxide or oxygen a “pollutant” and regulate that. The Court is undoubtedly correct. It’s the legislation that’s at fault, and the Court is bound to determine whether a law is Constitutional or not, and whether or not a regulation is valid according to the relevant law, not whether the law is asinine or not. Though predicting changes in these types of events under a changing climate is difficult, understanding vulnerabilities to such changes is a critical part of estimating vulnerabilities and future climate change impacts on human health, society and the environment. Quite correct Tom, and even then only if you live in the Tropics. See what I mean, it’s the underprivileged Third World what’s going to get screwed. Pay up immediately. it’s not David Rose’s article, it’s Jonathan Leake’s. Rose is a reporter on the Mail, not the Times. Anyone that has ever seen a synoptic chart from western Europe during that July of 2003, knows that it did had nothing to do with Global Warming. Naturally, such charts have never been published by the MSM, and can only be found in the occasional shaddy, non-peer-reviewed weblog. I tipped the Telegraaf (Holland’s biggest newspaper) about this. Hopefully they’ll pick this up also.